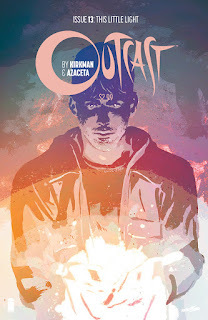 New York Times bestselling writer/creator Robert Kirkman (THE WALKING DEAD, INVINCIBLE) and artist Paul Azaceta (Daredevil,Punisher Noir) will launch a new story arc of their ongoing Skybound horror series OUTCAST BY KIRKMAN & AZACETA this November. Previously in OUTCAST BY KIRKMAN & AZACETA, Kyle Barnes began to piece together clues about his strange abilities and plague of tragedies. He discovered a new sense of purpose, but also a growing concern for his ostensible partner Reverend Anderson. OUTCAST BY KIRKMAN & AZACETA #13 hits stores Wednesday, November 25th.